The rallying call for Sri Lanka’s much needed Consumer Product Test Lab received a sudden boost when the specialised agency for public health across the world threw its support behind the initiative on 16 February. “This will assure the speed and high quality of market product testing and lab reports of Sri Lanka’s CAA” said a supportive WHO Representative in Sri Lanka Dr Jacob Kumaresan in Colombo. WHO’s Dr Kumaresan was discussing with Minister of Industry and Commerce Rishad Bathiudeen in Colombo about WHOs position on the proposal to establish a Product Testing & Safety Lab for Sri Lanka’s apex Consumer protection body, the Consumer Affairs Authority (CAA). Joining Minister Bathiudeen were Senior Advisor to Minister Bathiudeen Himali Jinadasa, Director of Hettigoda Industries (Pvt) Ltd Vidyani Hettigoda and CAA officials. Minister Bathiudeen, stating Sri Lanka’s case for a national consumer testing lab, explained: “The Consumer Affairs Authority (CAA) under HIS Ministry is the apex government organization established to protect consumers’ interests and ensure fair market competition in Sri Lanka. Sri Lanka seeks WHOs assistance to CAA’s proposed Product Testing & Safety Lab. This project, once constructed, shall be a milestone in the Consumer Protection history. CAA’s experience is that monitoring mechanisms such as testing are not sufficient enough to eliminate the malpractices in the supply chain. The mechanism is also not able to cover the entire country. Insufficient testing facilities to get analytical reports on food items is another hindrance that CAA has been facing for a long time. Some testing labs are not accredited. Also it needs to test imported products better. Therefore I am keen to establish a dedicated, high performance lab for CAA’s demanding lab work. Among the quality parameters tested in the market by CAA are added sugar content, salt content of snacks, fast food fat content, testing vegetables for pesticides, bottled water chemical and micro biological properties etc. WHO’s Dr Kumaresan responding to Minister Bathiudeen said that such a lab will strengthen domestic consumer protection greatly. 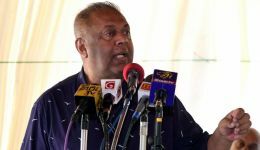 “It appears that Sri Lanka has multiple number of labs for product testing and this is not as supportive as it seems. he suggested a single, centralised national level lab for all frequent testing of consume products. Such a centralised lab will assure the high quality of test reports, speed, stronger legal protection and better labelling. This is a promising project but not a responsibility of one Ministry but a joint effort. Funds could be sourced from international agencies such as the World Bank if CAA proposal can be jointly worked with the stakeholders of legal, health and food processing sectors.